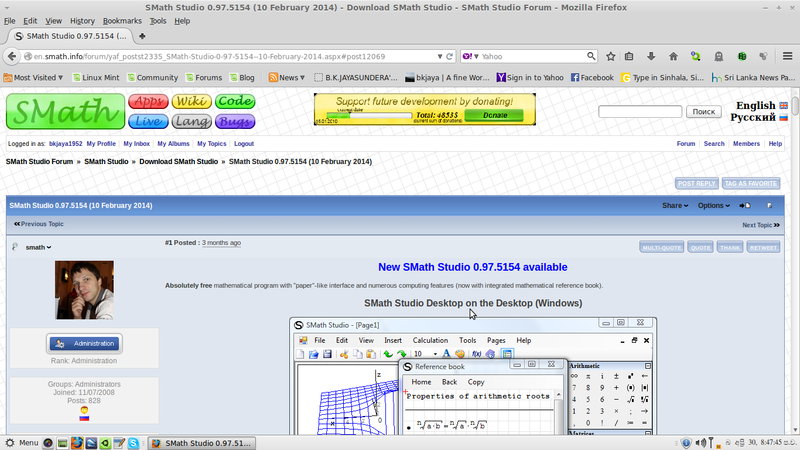 SMath Studio is a free software very much similar to MATHCAD. 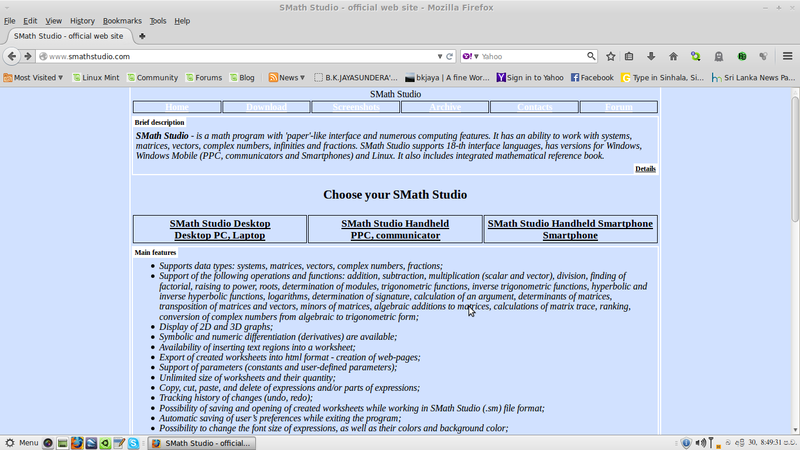 First you will have to go to SMath Studio – Official Web Site to get the software downloaded.The software is available in Smath Forum .After obtaining the forum membership SMath for Linux can be downloaded .Move the downloaded tar.gz file to home folder and extract it. Then you will get a folder namely “SMathStudioDesktop.0_97_5346.Mono”.This folder contains an executable file called “SMathStudio_Desktop.exe”. “mono-complete” has to be installed in order to run “SMathStudio_Desktop.exe” file . 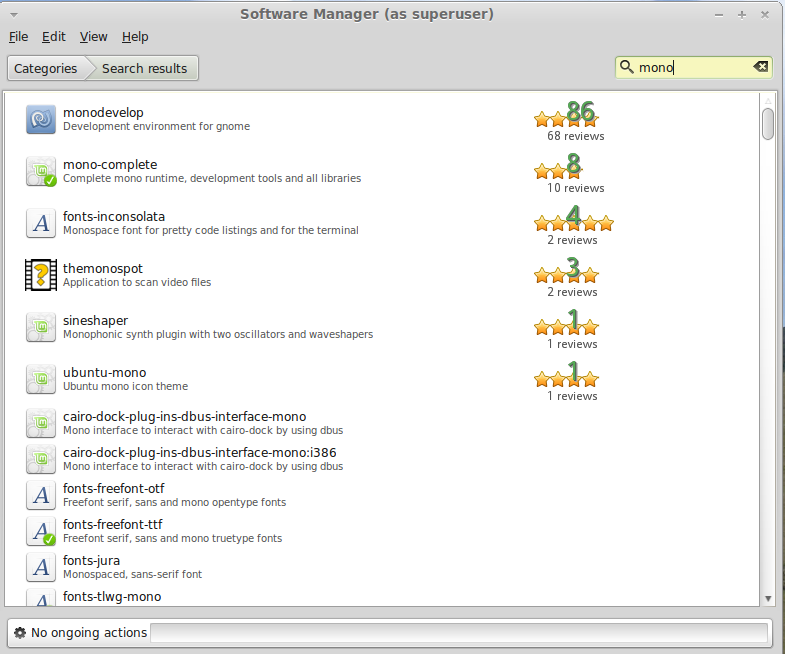 You can install mono using the Software Manager of Mint . 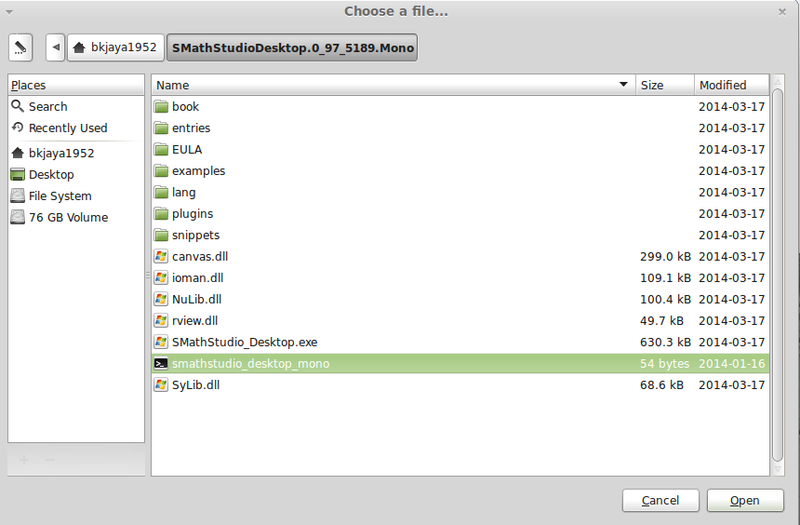 Now SMath Studio desktop can be accessed by double clicking “SMathStudio_Desktop.exe” file in the SMathStudioDesktop.0_97_5346.Mono folder in the home directory. How to make an executable desktop icon of SMath?At the decktop right click the mouse and press Create Launcher. Then fill the cages as follows. Then press the browse button by the side of command cage, to locate “SMathStudio_Desktop.exe” file in the “SMathStudioDesktop.0_97_5346.Mono” folder in the home directory.Then press ok button .Now you will get a Launcher icon on the desktop. I followed the above steps to install it for Linux. Everything went as you say above except that Smath does not work. An attempt to copy and paste some text gives me a “do you want to save …” dialog box and eventually exits Smath. First ,you will have to install “mono-complete” using the software center . Extract the downloaded file to the home directory. 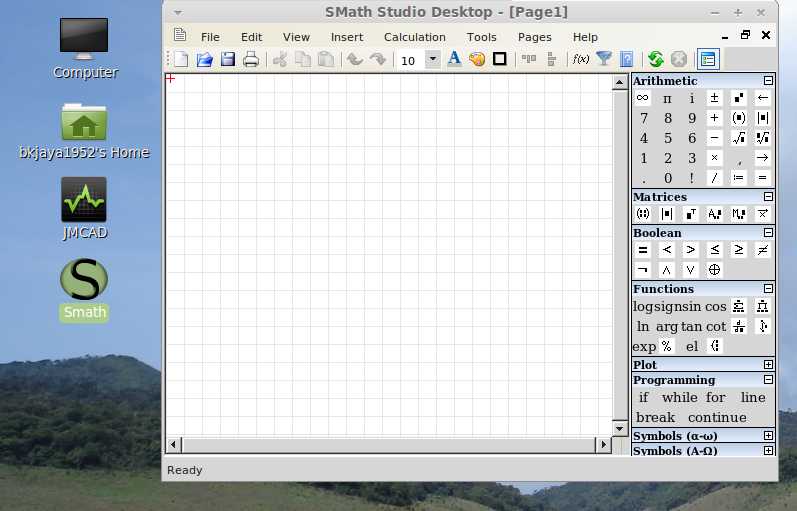 Now you will get the Smath Studio Desktop. I have followed the steps to the letter many times to no avail. The Software Manager shows I have Mono Complete installed. However, I cannot get the Smath to open by 2x clicking “SMathStudio_Desktop.exe”. I get the dialog box asking me what program I want to use to open it with and mono-complete is not on the list. Does that indicate that mono-complete is not in fact installed or not working properly or …? Smath does open if I 2x click “smathstudio_desktop_mono” but, alas, it does not work. I can still use Smath with Windows but it is becoming increasingly inconvient. Any advice or suggrstions would be most appreciated. If mono-complete is not in the list you can use the software called “Ubuntu Tweak” to include mono-complete program.First install “Ubuntu Tweak” ( please ref – https://launchpad.net/ubuntu-tweak). Then open Ubuntu Tweak menu and go to Admins>File Type Manager>Application>DOS/Windows executable . Double click mouse on DOS/Windows executable and change the application program to Mono Runtime. 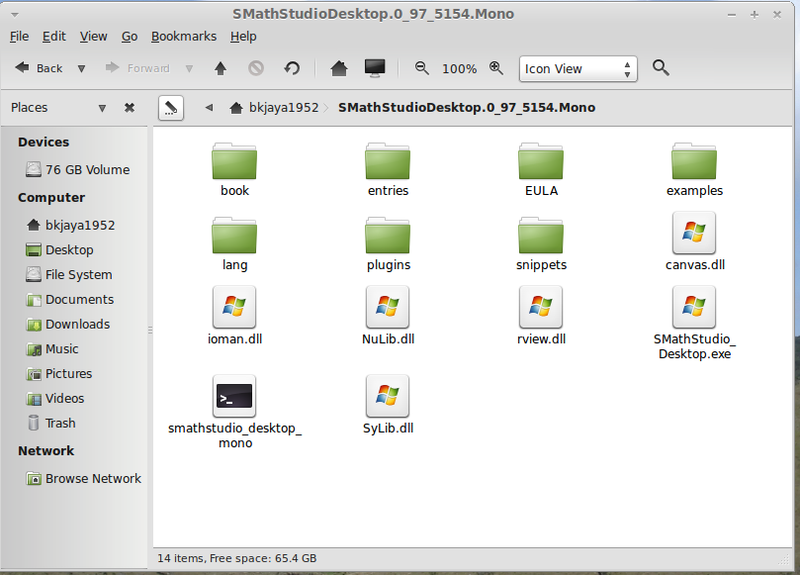 I am interested in this thread as I have just installed mono-complete (3.2.8) and Smath Studio (0.98.5395) on my PC running Linux Mint (17). I get similar problems to Bruce. I cannot run the program by double clicking the .exe file but I can run it through a terminal window. The program seems to run OK and I can open and edit example fles but get similar issues to Bruce with the “cut and paste” commands with the code usually crashing. Any advice much appreciated as I am a heavy user of Mathcad under windows but want to migrate to Linux now. Issue with Cut/Copy/Paste on Linux fixed. In the terminal, placing mono in front of it seems to make work in Mint 19 after you have installed mono-complete in the software center. I haven’t extensively tested it yet though. Directly clicking on the exe didn’t work. I plan on making a shortcut that runs it with mono and adding the shortcut to my shortcut list. Smath does not work well in Linux Mint 19. You can get it to come up and calculations work, however you can not save .sm page files. The frame page indicator says 1 or 42000 pages when you retrieve 1 page, When the program says ready there’s nothing there and it is very slow. The save in Mathcad filetype is slightly better but unreliable. You can not import data with rfile(filename) — get empty stack or importData(“path”) — it does not parse path correctly and no matter what you do it returns — file does not exist even when it’s in the same directory. Mono-complete is correctly installed. Smath build 6884 is very broken in Linux Mint 19 64 bit. I have not tested the latest version. Could you please post your problem to SMath Studio Forum https://en.smath.com/forum/. ?